The rumor mill tells of a man who murdered his wife here in 1935, which may be the spark for the odd happenings. 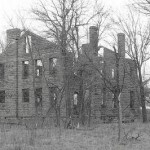 Only a wall and the foundation still exist, as the once beautiful mansion has been ravaged by time and 2 fires. Some witnesses say their flashlights suddenly stop working as they approach the place, voices shout at them from nowhere, and animals appear out of thin air. Strange smells and a suddenly burning fire in the gutted fireplace also have been reported.